***Silver-Level Certification: Coursework & Online Testing*** LSH Silver Certification ENROLL NOW! Individual Certification at this level demonstrates to clients and employers the individual’s dedicated interest in Low Stress Handling®. Hospital Certification at this level demonstrates to clients and staff the hospital’s commitment to appropriately training staff in Low Stress Handling® methods. Certification requires that each individual take all 10 lecture and lab courses in the pre-determined order. The classes are taken online, via an easy-to-use portal. After each lecture, the individual takes an online multiple-choice examination. Grades will be displayed as soon as each quiz is completed. If the student does not pass a quiz the first time, the quiz may be retaken until a passing score of 90% or better has been attained. Each quiz must be passed with a 90% or better in order to move on to the next module. After passing all 10 multiple-choice quizzes and a final multiple-choice exam, scoring 90% correct or higher, the individual receives Certification in Low Stress Handling®, Silver-Level. This program is open to all individuals including; Veterinarians, Veterinary Technicians, all other clinical staff, veterinary and veterinary technician students, groomers, dog trainers, animal rescue workers, shelter staff, and animal owners. Six months (180 days). Individuals who have not completed the course after 180 days must re-enroll to attain certification. There is a re-enrollment fee of $15. Like Board Examinations for Veterinarians or the Veterinary Technician National Examination, Certification in Low Stress Handling® is a one-time process. Certification requires that a minimum of 51% of staff (including part-time) who work more than 8 hours per week become certified in Low Stress Handling® as described under the Individual Certification section. To re-certify, hospitals must re-establish a minimum of 51% of current staff that is Certified in Low Stress Handling®. At 2.5 years, the hospital receives notification that it’s time to re-certify. Only staff members who are not Certified in Low Stress Handling® need to take the course. Note: A certified hospital may decide to make it standard policy for all new technicians and staff to receive Certification in Low Stress Handling® as part of safety training. In that case, those employees join the hospital’s roster of certified staff members as they become certified. As a result, when it’s time to re-certify the hospital may easily still retain the 51% minimum of certified staff, even with normal staff turnover. Note: During the three-year period, a certified hospital may hire new technicians and assistants who completed their Certification in Low Stress Handling® elsewhere. When it’s time to re-certify, those new previously-certified employee are counted toward the “51% minimum” requirement. 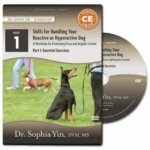 It is recommended that each student has access to (either via direct purchase, through a student library, or other means) the Low Stress Handling®, Restraint and Behavior Modification of Dogs & Cats textbook. Click above or below on this page and the course will be automatically loaded into your cart. Fill out the registration form, submit payment and you are ready to start right away. Note that if you are seeking certification, you must enroll in the entire Low Stress Handling® Certification Course. Individuals may not use the Group Discount options unless they are purchasing a minimum of 4 seats in the course. Watch the lecture and lab videos in the pre-determined order. Take the multiple-choice examination at the end of each lecture or lab. For the five labs, we recommend that you practice the skills as you are working through the videos. We also strongly recommend that you download the accompanying Low Stress Handling® Certification Workbook in the first module of the Certification program and read the Study Tips ahead of time so that you will know how to get the most out of the program. You will receive a PDF certificate of completion via download from within the Low Stress Handling® University that you can display on your wall. International Customers: Please contact CattleDog Publishing at support@lowstresshandling.com to let us know whether you would like a Low Stress Handling® Silver Certified badge (badge only includes the Silver Certified logo; no name or credential is displayed on the badge) sent to you. If you would like a badge, there will be an additional shipping cost based on shipping charges to your country. We can provide you with the cost once you contact us. There is no shipping charge for customers in the United States. We can include you on our website’s listing of certified individuals (currently under re-development). Information is taken from student’s user profile from within the Low Stress Handling® University. Please ensure your profile is updated. You may add to your e-mail signature and website the words “LLow Stress Handling® Certified – Silver” and the year of certification. You may include the Low Stress Handling®Certified – Silver logo (available upon request and verification of certification) on you website, along with a link back to the Certification in Low Stress Handling® page, so your clients can see what the certification means. You may tell clients that you have been trained in Low Stress Handling®via online lecture and testing, or that you are Certified in Low Stress Handling®. Go to http://lowstresshandling.com and select Course Catalog from the menu at the top. From the Course Catalog, choose Low Stress Handling® Silver Certification and then select the Group Discount Tier which applies to your group size (group size is cumulative across all enrollment periods from the same business. Group enrollments must be verified by CattleDog Publishing in order to prevent fraudulent discounts being purchased). On the Cart page, make sure to enter the number of seats you are purchasing (Group 1 = 4 – 14 seats; Group 2 = 15 – 19 seats; Group 3 = 20 – 44 seats; Group 4 = 45+ seats). Email CattleDog Publishing a list of enrollee names and email addresses for Group Discount verification. Also include the primary contact person’s contact information for enrollee progress reporting purposes. The below information is also required for certification of the hospital upon enrollees’ completion of the Low Stress Handling® Silver Certification program. Enrolling additional staff members after initial registration: If you decide to add more staff members, you can enroll them at the same per-person rate by following guidelines under Step 1 and selecting the appropriate Group Discount Tier based off of your business’ total cumulative enrollment. For historical enrollment numbers please contact CattleDog Publishing at support@lowstresshandling.com. Step 2: Individual students will receive a Welcome email from Low Stress Handling® University that tells them how to access the certification course. What individuals need to do: Individual staff members watch the lecture and lab videos in the pre-determined order and take the multiple-choice examinations. For the five labs, we recommend that participants practice the skills as they are working through the videos. We also strongly recommend that they download the accompanying Low Stress Handling® Certification Workbook from the first module of the course and read the Study Tips ahead of time so that they will know how to get the most out of this program. The discussion questions and practice exercises will be especially important for students to enhance their learning experience. Once the staff member has completed the entire course and passed all of the tests, they will receive a downloadable certificate of completion from within the Low Stress Handling® University and a badge to wear with the Low Stress Handling® Certified – Silver logo (sent only upon request). The badges will be sent once the staff members have completed their Silver Certification (For international customers, there is a shipping charge to receive the badge). How management can facilitate the learning process: We recommend that the hospital uses the Low Stress Handling® Certification Workbook discussion questions and practice exercises to help facilitate learning. Weekly staff meetings to discuss the questions or practice exercises can help keep members on track and ensure that the process is a group effort. Your hospital is listed as Certified on www.lowstresshandling.com (including the number of certified employees), along with a link leading back to your website. Individuals will also be listed on the certified individual’s page. Compare this cost against the full price ($615) for watching all of the videos via DVD without becoming certified. Individuals pay via the Low Stress Handling®University payment system. An invoice and enrollment information will be sent via email at the completion of the payment process. Groups may pay by credit card (Visa, MasterCard, Discover, American Express) directly through the Low Stress Handling®University payment/checkout system; checks/money orders (payable to CattleDog Publishing) must be approved prior to admission/enrollment. Groups must give CattleDog Publishing the participant’s contact information so we can verify their enrollments with their Group Discount Tier status. After initial registrations, hospitals and groups may enroll additional staff members or decide to certify new staff as part of regular training even after the hospital is certified. Hospitals will only be charged the discounted individual certification price per additional staff members, based on total cumulative enrolled group size. The only cost associated with Hospital re-certification will be to enroll additional/new hospital staff in order to meet the 51% minimum certified staff requirement. They are given renewed access to their course with no loss of progression. Their time is extended by 180 days from the date of re-enrollment. All Rights Reserved. Low Stress Handling® name and logo are registered Trademarks and may not be used without permission from CattleDog Publishing. For more information about the Low Stress Handling® Certification program please contact CattleDog Publishing at support@lowstresshandling.com or (530) 757-2383.